Looking to get your children ready to go back to school, live in Wayne County Michigan, and looking to have some fun? 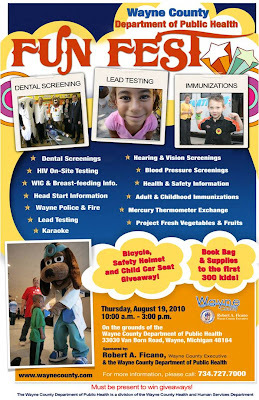 The Wayne County Public Health Department is offering a FUN FEST featuring free book bags (first 300 kids), hearing, vision, blood pressure, and dental screenings, Karaoke, information about WIC, breastfeeding, Head Start programs, health and safety, HIV and lead testing, Project Fresh - Vegetables and Fruit, and yes - immunizations. The event runs 10am to 3pm Thursday August 19, 2010 at the Wayne County Health Department on 33030 Van Born Road. Need more information about this event - call 734-727-7000.